"Courage is not one of the virtues, but the form of every virtue at the testing point." In late May 1943, the B-24 carrying 26-year old Louis Zamperini went down over the Pacific Ocean. For nearly seven weeks --- longer than any other such instance in recorded history --- Zamperini and his pilot managed to survive on a fragile raft. They traveled 2,000 miles, only to land in a series of Japanese prison camps, where for the next two years, Zamperini underwent a whole new set of tortures. His is one of the most spectacular odysseys of this or any other war, and "odyssey" is the right word, for with its tempests and furies and monsters, many of them human, Zamperini's saga is something out of Greek mythology. As we learn from the early pages of "Unbroken's" compelling drama, Louis Zamperini grew up in Torrance, California. Before joining the military, Zamperini developed into a world-class runner due in no small part to his juvenile delinquency, breaking into homes then fleeing the police who chased after him. 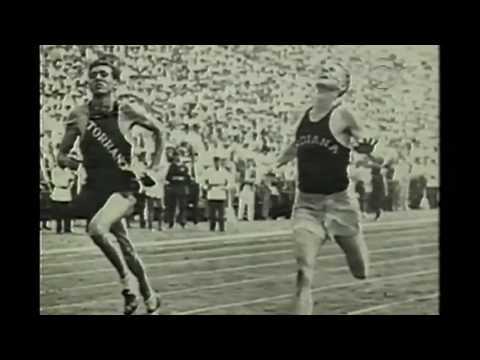 Zamperini ran the 5,000 meters at the 1936 Berlin Olympics then followed that achievement by doing the same while a student at the University of Southern California where he came close to the four-minute mile. At 19, Louis Zamperini (left), was the youngest member of the 1936 US Olympic Track Team. With World War II drawing near Zamperini enlisted in the Army Air Corps and was eventually stationed in Hawaii where he became a bombardier on the hard-to-fly B-24, sometimes referred to as the Green Hornet. It was that type of plane that went down while searching for a missing plane. Of the 11 men on board, only three --- Zamperini; the pilot, Russell Allen Phillips; and the tail gunner, Francis McNamara --- survived. They did so by hanging on to a canvas-and-rubber raft which also remained from the wreckage. According to author Hillenbrand, the men saved themselves by eating albatrosses that perched on the raft. Always inventive Zamperini would tie improvised hooks to his hands creating a claw used to catch fish that supplemented the fowl. Fabric from a second raft was used to cover the men from the scorching sun. Their thirst was sometimes quenched by rainwater. Sharks seemed to always be nearby and at times jumped into the raft. They were attacked by using oars and when killed, the shark livers were added to the already limited menu. After 33 days at sea, McNamara died. Rather than resort to cannibalism Zamperini and Phillips cast their crewmate overboard. How did the remaining two men pass the time? We're told they extended their days by asking each other questions, cooking imaginary meals, and singing "White Christmas." Marshall Islands (site marker), Pacific Ocean. The Marshall Islands were spotted on the 46th day. Twenty-four hours later they were picked up by Japanese sailors. It's worth noting that while only one in 100 Americans captured in Europe died, nearly one in three perished in Japanese captivity. As an Olympian Louis Zamperini was in a special class of war prisoners. He was used as part of a propaganda campaign but also became a prime candidate for torture. The unrelenting abuse included humiliation, starvation, medical experiments, slave labor and disease. His chief tormentor was what book reviewer Margolick called "a psychopathic sadist" named Mutsuhiro Watanabe, also known to prisoners as "the Bird." With American bombers increasingly filling the skies American P.O.W.' s knew their time in the camps was short. According to some historians the bombings of Hiroshima and Nagasaki likely saved those still held captive from the Japanese threat to kill all P.O.W. 's rather than handing them over at the end. What was waiting for Louis Zamperini after the war? Hillenbrand says it was the same things facing other soldiers: Alcoholism. Flashbacks. Nightmares. And rage. However, in the fall of 1949, Louis Zamperini was converted to Jesus Christ by evangelist Billy Graham. It was at that point, not the last day as a P.O.W, that Zamperini' s war and personal battles came to an end. It was from that spiritual experience Zamperini wrote to Watanabe forgiving him for all manner of indescribable torture. Laura Hillenbrand wrote #1 selling books, "Seabiscuit" and "Unbroken," while suffering from chronic fatigue syndrome. Zamperini's celebrated story had already been the subject of three books. According to an article in The Washington Post (November 28, 2010), Hillenbrand's famous subject wondered what more there was to be said. "Laura told me she wanted to write my biography. I told her I was already finishing my memoir. She said, I must do it. I said, Laura, I've milked this thing dry. There's nothing left. She said, I must." Those who've read "Unbroken" are grateful Laura Hillenbrand pursued and achieved that goal. Universal Pictures bought the rights to Louis Zamperini's story years ago. Yet it fell to actress and director, Angelina Jolie, to take the project and turn "Unbroken" into a major motion picture. It's only fitting that a film depicting the life of someone who experiences spiritual healing premiers Christmas Day. After a 40-day bout with pneumonia, Louis Zamperini, age 97, who faced some of the worst of what the world has to offer, passed quietly in his sleep. All members of his family were present. He was to be Grand Marshall of the 2015 Rose Bowl Parade New Year's Day in Pasadena, California. Tournament of Roses officials have decided he is irreplaceable. The official car in which Zamperini was to ride will have an empty back seat to honor his memory. Louis Zamperini, age 97, passes before "Unbroken" movie is released. Maybe you can find time this holiday season to read or see "Unbroken" on the big screen--a true story of survival, resilience, and most importantly, redemption. It's an adventurous journey of faith dedicated to anyone who is lost or broken, just as Louis Zamperini was, long ago and far away.